When we moved to Canada, I sold any guitar gear that wouldn’t fit in a backpack. This has left me without the ability to plug in my electric guitar for the last ten months, a situation that must be rectified (ha, ha). I just need a small practice amp, and those can be found on an IC these days. One needs only to add a little soldering, attach a speaker, repeat as necessary for whatever mistakes one makes, and ta-da: a small custom amp that one could have bought mass-produced from China for 1/50th of the price of building one’s own. But of course there is value in the making, or so we tell ourselves. Anyway, I’ve built my circuit (more or less the same one as on the op-amp’s datasheet) on a breadboard and it sounds fine except for the complete lack of shielding. Since it’s now possible to get one-off PCBs without spending a fortune, and using a real board is more fun than protoboards, let’s do that! Eagle Light (free as in beer) is the choice of many a hobbyist. I have poked at Eagle before, but never liked it enough to do anything substantive. These days, getting it to run at all means finding library versions that aren’t used in any current Linux distribution, building them, doing some LD_LIBRARY hacks, setting up a 32-bit runtime, and so on. Yes, I also did that this weekend. Eagle has a nice big standard library, but I feel learning it at all is a bit of a dead end when there are usable, truly free alternatives. And KiCad looks like it just may fit the bill. I apt-get installed it and was off to the races. 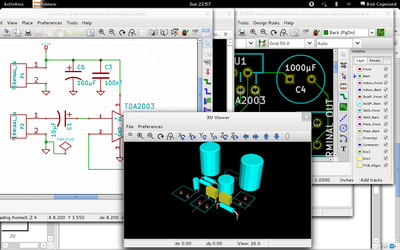 Overall, KiCad is a nice piece of FOSS software that can easily do whatever one would do in Eagle. 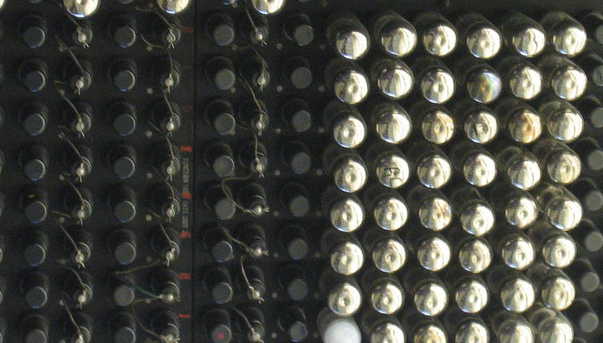 Unfortunately, it still reminds me of what I hate about PCB software in general. I find designing a PCB to already be extremely fiddly and unfun; as a non-expert, I just want to build a schematic and then place and route things with sensible defaults. Instead, what I wound up doing was learning to use the symbol editor, and the module editor, gathering various facts about drill and pad sizes, and picking up KiCad’s various quirks such as how you have to constantly reload newly created libraries, and how the UI frequently makes no sense. Of course, UIs never make any sense in EDA tools, so you sometimes just have to go with it. Doing librarian work is ultra-boring, especially for tiny boards like this. Still, in the course of a few hours, I built the basic schematic (including adding three new symbols), passed ERCs, created three missing footprints, and did an initial routing of the board. Not too bad. In the last decade component libraries have grown 3-D models, which is kind of neat. On the one hand, it’s not terribly useful since the canned components are unlikely to closely match reality, and editing 3-D models of components is even less interesting to me than editing their footprint. But, it does make for decent screenshots like the one above.